Diagnostics and epidemiological data are often lacking in Suriname. Therefore the Molecular Laboratory of the Medical Scientific Institute (department of Biochemistry) focusses on the detection and identification of pathogens that are, as yet, not detectable in Suriname. 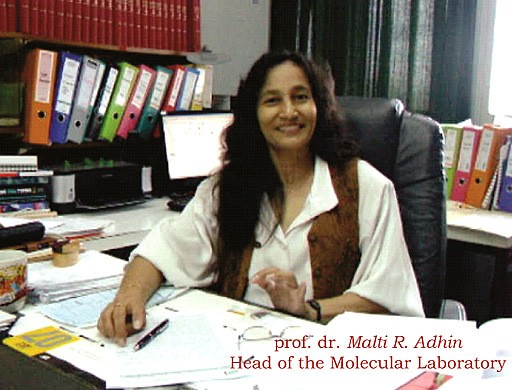 To support the clinical practice, as from 2006 the department of Biochemistry, under supervision of Prof. Dr. Malti R. Adhin, has set up a total of 12 various tests in Suriname. With these tests, the Medical Scientific Institute directly contributes to improving healthcare, underlining the link between the community and the University. The introduction in Suriname of these diagnostic tests has an impact on policy decisions because of the possibility of data collection (dengue virus serotype ring, influenza detection and typing, chlamydia typing) and is directly relevant to the diagnosis and/or therapy of the sick person (Early HIV diagnosis, Human Papilloma virus detection and characterization, detection of ocular herpes simplex, detection of the Chikungunya virus). For the Ministry of Health, the biochemistry department does the diagnostics for the national influenza surveillance and is testing HIV in babies.